We will do our best to answer you for one working day. 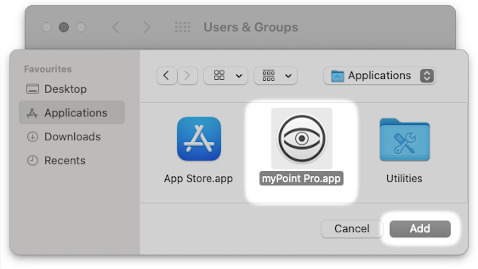 On some Mojave systems myPoint may lag in tracking the mouse pointer or even stop following it. In such case please activate the "Advanced mouse tracking" option in general preferences panel. Unselect the "Advanced mouse tracking" option. Use momentary Locator: animated or static ring with display time about a second. Activate the locator via a hotkey. When myPoint icon is removed from the menu bar extras, myPoint panel can still be opened. - Relaunch myPoint (while it is already running in the background) from the Applications folder. - Use "Open myPoint panel" hotkey in General preferences. (default combination is Control + Option + Command + P). 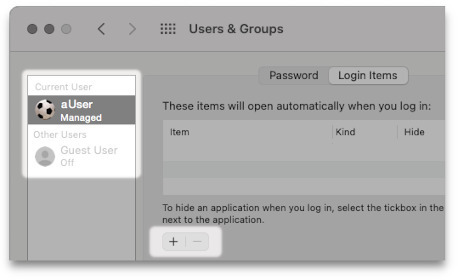 - Open myPoint panel and select "Show myPoint icon in menu bar extras" checkbox in General preferences view. - Use "Toggle icon visibility" hotkey in General preferences. (default combination is Shift + Control + Option + Command + Space). - Deselect the "Show myPoint icon in menu bar extras" checkbox in General preferences. Please write down this hotkey before you hide the icon. In case the icon is hidden and the hotkey is forgotten, please relaunch myPoint (while it is already running in the background) in order to open myPoint panel. Uncheck the Automatically start option in myPoint panel. In Users & Groups window select the preferred user - the current user in common case. Apple, the Apple logo, App Store, Mac, Mac OS X and macOS are trademarks of Apple Inc.